Like other rosellas, adults form permanent pairs that maintain close contact all year. These pairs and their young may form small groups. 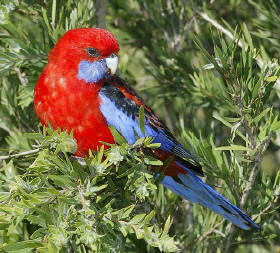 The Crimson Rosella is endemic to forests and woodlands of eastern Australia. In north Queensland it is a scarce resident of upland rainforests. Unlike southern populations, there is no distinctive immature plumage. Small flocks are observed regularly round Chambers Wildlife Rainforest Lodge . The loudest call is a brassy ‘kweek kweek’. Food is mainly seeds, obtained from a great variety of plants, including herbs and tall trees. The 'Crimson Rosella' has to be one of the prettiest Australian parrots, coloured a bright crimson, with blue on the tail, wings and 'cheek'. Luckily for us humans it is common in forests along the east coast, and can often be seen in adjacent urban environments. Like the other rosellas, the call includes a series of piping whistles and chattering. The piping calls are three high, echoing whistles.